Hello! I have been given an opportunity to host a giveaway for the Dark Shadows Blu-Ray Combo Pack! I figured why not! I have not seen the movie myself nor do I own a blu-ray dvd player lol. However, I do plan on having a movie night of my own when I get my hands on the dvd! Want to have a movie night for yourself as well? Then be sure to keep reading for a chance to win! I have used this app that you see below and took the "Are You Creepy Enough? Quiz" I am "You are... A CHILD OF THE LIGHT At the midnight hour you are more likely to be found raiding the fridge for a snack rather than howling at the moon. You’re grounded in reality yet I bet sometimes you linger over to the dark side. Red to you probably symbolizes roses...not blood, but a trip to the haunted mansion should not be out of the question. Nevertheless, all beings serve a higher purpose...Barnabas needs you regular humans to feed on;)"
The quiz is a simple 5 questions and takes like 10 seconds. 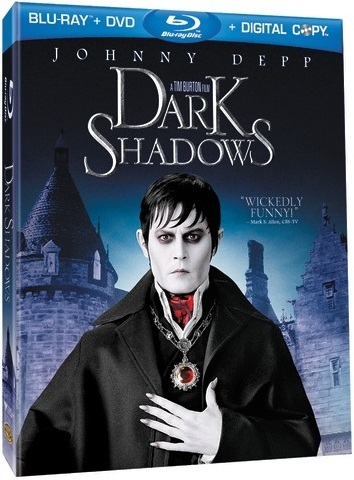 I love the makeup in the movie ( I have seen commercials) and I love Tim Burton movies! There will be no rafflecopter for this giveaway. Just leave your entries and answers in the comments section below. I will use random.org to choose the winner on the 16th and email the company that is providing the prize. Good Luck to you all! Be sure to answer all 3 of the above questions in the comments section of this post. I will email the winner on the 16th and will have 24 hours to respond since the giveaway ends on the 18th. I don't want to take any chances on missing the prize. I'm a gfc follower. I got creepily conservative. and my result was : You are... COLLINS CREEP-TASTIC! 3. I got COLLINS CREEP-TASTIC!! !